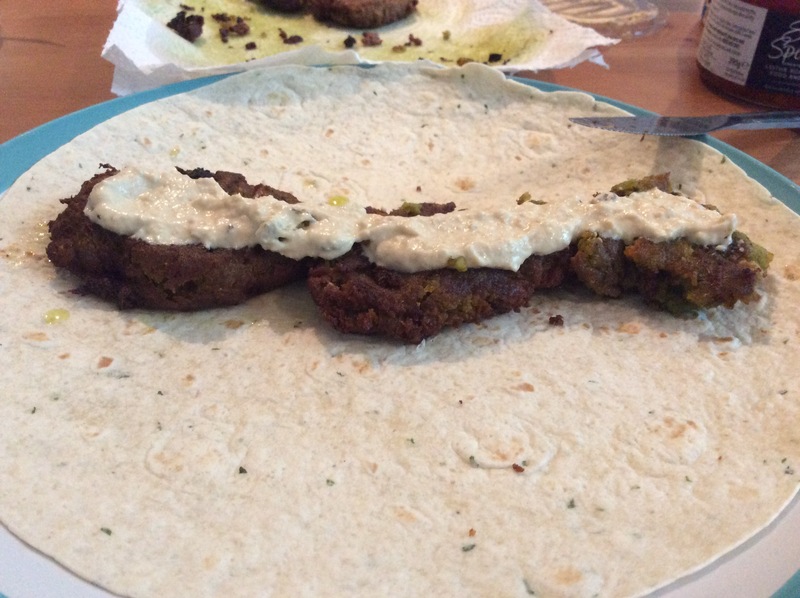 Falafel is one of my favourites at the moment and I was buying a mix in the supermarket – but then I discovered how easy it is to make! I’ll go through it step by step and you can see. 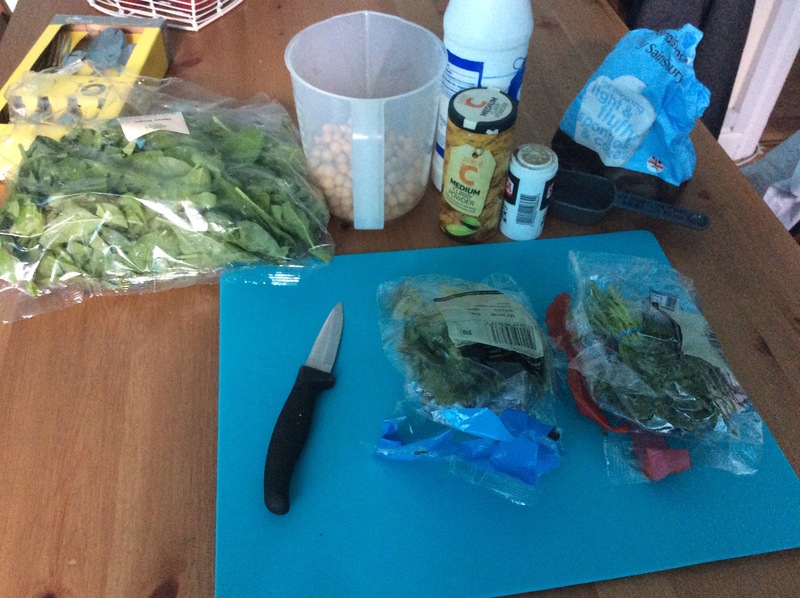 It may seem like a few ingredients but I found quite a bit of it I had in my cupboard anyway. I recommend getting it all out on the table before you start and putting it away as you’ve used it – then when you are done you have a nice tidy kitchen – hurrah! So first of all add your onion and garlic to a frying pan on a low eat with a very small amount of oil. You don’t want to make it too wet as this will make the mixture soggy but if it starts to catch and go brown and a splash of water and let it evaporate off. You want the onions to go translucent but not too brown, they’ll be finished off later anyway. Next in a jug/bowl/container pour in your drained chickpeas. Add your chopped parsley, corriander/cilantro, curry powder, salt and pepper and give it a rough mix with a spoon. Scoop out the flesh of your sweet potato and add it to the chickpea/herb mixture. Then put it in a food processor/blender/hand blender and blitz. 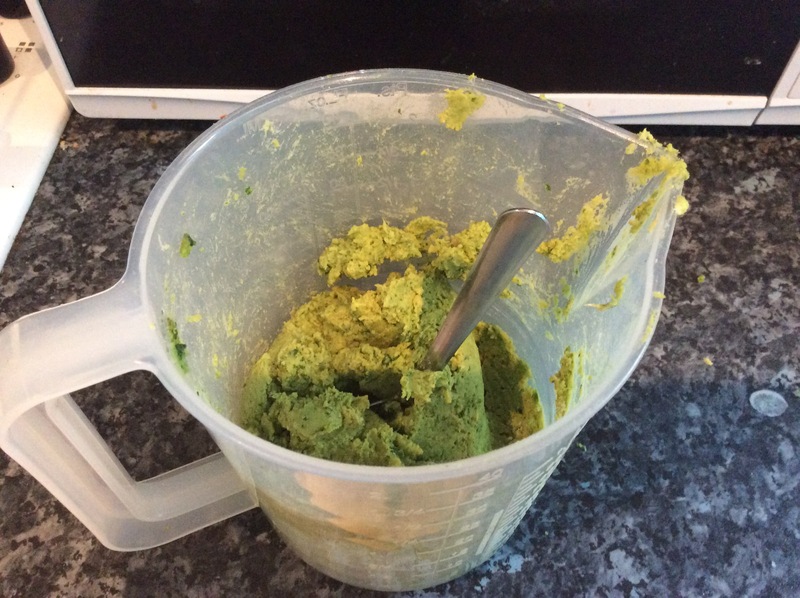 I like mine pretty well blitzed but feel free to leave it a bit chuckier – you maybe also need to mix it with a spoon or scrape down the sides a few times to get an even consistancy. It should be a bit runny/gloopy at this point so start stiring in your flour. It shouldn’t really form a dough but more of a very thick batter. A good way to tell is you should be able to leave your spoon on top without it sinking. Then in the frying pan warm up some oil. Now I have no way of knowing what temperature it needs to be to start frying but try some little test balls of mixture. It should hit the oil and start frying but not too ferociously beause it will burn. Spoon about a tablespoon of mixture into the oil and I like to press mine down a bit into a patty shape so they cook evening. Wait till they go a bit brown underneith and gently flip it over to cook the other side. Some of them flip better than others – don’t worry if it breaks, just leave it to cook and then scoop it out! I find it’s easier to do these in batches of 3-4 and the whole process takes me about 10-15 minutes. You can make them as big as you like but I find a tablespoon of mixture is just about right to make them bitesize and cripsy. Then serve! 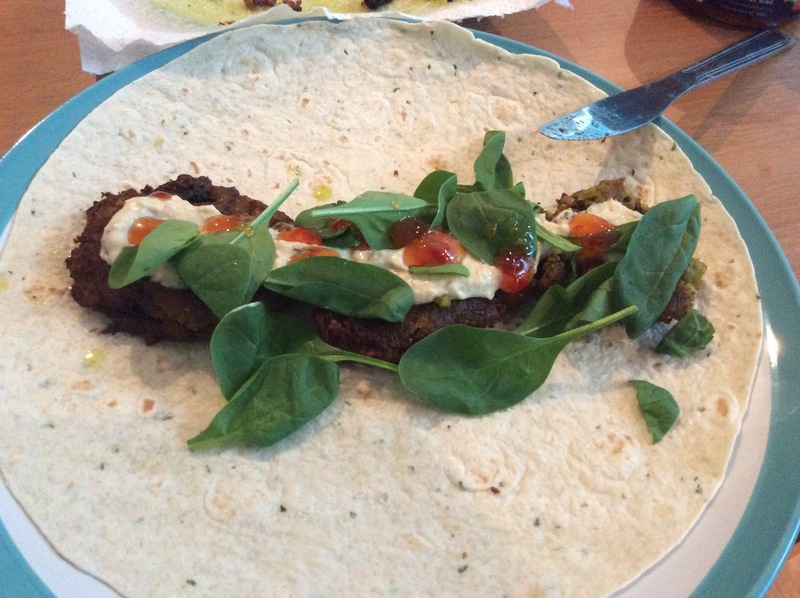 I like to serve mine in a wrap with some hummus, fresh spinach and sweet chilli sauce – even Josh as a convinced Carnivore said that this falafel is becoming one of his favourite meals – can you get higher praise than that? ?